South Korea – Reconsider your proposals to expand and incentivise the inhumane puppy mill industry! Home / Blog / South Korea – Reconsider your proposals to expand and incentivise the inhumane puppy mill industry! South Korea is planning to expand its already booming puppy mill industry. We are asking you to help bring about an immediate u-turn on these plans and to stop the cycle of horrific abuse and neglect suffered by these innocent dogs and puppies born into such horrendous conditions. Please call on the Korean government to act and to listen to public opinion by signing our online petition. You can also help by writing directly to president Geun-hye Park, we have a suggested message you can use below which you can add your own words to. Let’s show them how strong our voices can be! Click HERE to find out more about these latest proposals from the Korean Observer. Telephone numbers of Korean Embassies around the world: Click HERE! Email: Click HERE for email addresses of Korean Embassies and Consulate Generals around the world! Video: CARE (Coexistence of Animal Rights on Earth). Dog farm in Gwangju, South Korea where dead dogs are left in the cages to decompose and for other dogs to eat. –	In the demand for smaller and smaller popular ‘tea-cup’ versions of various dog breeds, practices such as premature C-section are commonplace in the industry and often carried out by unqualified puppy mill staff with no regard to both the mother or the puppies’ welfare and often carried out without anaesthetic. –	Intentional malnourishment is also common in a bid to produce smaller and smaller dogs. These ‘tea-cup’ dogs often suffer from horrific genetic defects alongside being exposed to the unsanitary conditions found in most puppy mills. –	The practises at these mills echo those of other intensive factory farming operations, with repeated cycles of insemination and no break for the mother dog, which goes against modern veterinary thinking and advice along with abysmal and inhumane conditions for the breeding animals, caged for life often living in their own filth, suffering from a number of chronic health issues. 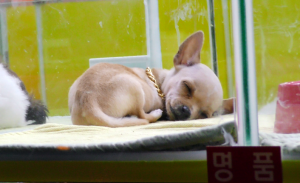 o	Is this what the average Korean consumer wants when purchasing a puppy? No! o	Is this information even disclosed to the end customer when purchasing their new puppy? No! o	Is this fair on the animal or on the consumer? No! Encouraging the puppy mill industry via financial incentives with regard to the opening of new mills or the upscaling of mill facilities goes against public opinion both in Korea and globally, is not in the public interest and showcases to the world that South Korea has a complete disregard for animal welfare. Growth in the pet sector in other world leading countries has come through the expansion of the pet food and accessory and service trade and not through the use of puppy mills, which is a dying trade in the majority of forward thinking counties. Supporting the intensive factory farming of dogs creates more opportunity for abuse, not less. In order for regulation to work it has to be actively policed, implemented by local law enforcement and supported through direct action and sentencing in the judicial system. South Korea’s record in this respect is appalling, to say the least, so any suggestion that the current proposals will seek to address some of the animal welfare abuses taking place in the pet industry right now is misleading in the extreme. It is cruel and inhuman to torture and eat pets!!! Stop it please!! Please stop it. This practice is pure evil. And has no place in today’s society. Love animals the right way. This is not the way! E conditions are horrible and that affects the health of the puppies. Please stop this practice. There are already enough dogs without hinges. Please, please stop this dreadful practise. This now has worldwide attention and is making your nation look really bad. Everyone I know has stopped buying anything made anywhere in Asia until this barbaric trade has ended. You are being watched and it reflects poorly on you and I’m guessing your economy will feel it. The spotlight is coming, the 2018 PyeongChang Olympics in South Korea will be the most heavily boycotted event in world history. 2,500,000 dogs eaten annually, beyond disgraceful!! South Korea: What kind of culture do you people have??????????? I guess you are proud of your ‘LIVE BOILED CAT AND DOG EATING NATION” REPUTATION. Despite dozens of worldwide petitions regarding this matter, even your Korean government, Park Geun-hye, seems to be in accordance with this way of live boiling animals for breakfast, lunch and dinner. Park Geun-hye has the power to change this barbaric culture and she chooses to do nothing. WHY????????????????? DO NOT EXPAND YOUR PUPPY MILL INDUSTRY. BAN IT. ALSO, BOYCOTT the 2018 PyeongChang Olympics in South Korea. Getting the Korean people to end the horrific torture and boiling cats alive would be a dream come true. I have no respect for people that think this is ok. Korea just does not care. I will boycott the Olympics and future business with Korea. The US teams should boycott the Olympics in 2018 as well for this reason. There is a place in hell for these people, and they should remember how they torture animals they will be tortured as well as the rest of the world turns their cheeks and ignores their cries. Social media should do more now that it is a global issue Now the posts must go to twitter and gain more attention. to the country and its constituents BURN IN HELL! !